Going to the no-internet (again) but before another post! 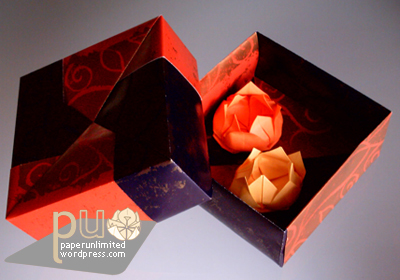 :) After the sonobe posts and an elefant break, I return to boxes. 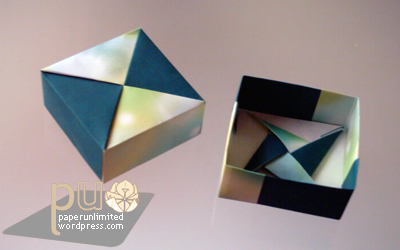 A simple box, again by Fuse :) I have done this in two variations the red and blue one (with golden pattern) was done with wrapping paper, the one in green tones was with my newest supply of origami paper and a bit of my first supply. 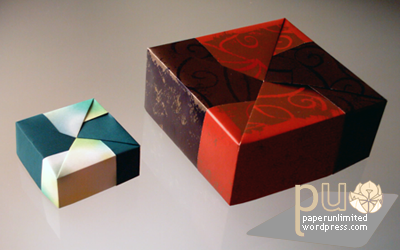 The blue, red and golden was done with 15×10.7 cm paper and ends up with 8.2×8.2×3.5 cm and the greenish was done with 7.5×5.3 cm the box is 4.1×4.1×1.7 cm. I found the diagram in the web, somewhere, but since I can’t remember where you can get here the page 1, page 2 and the page 3. 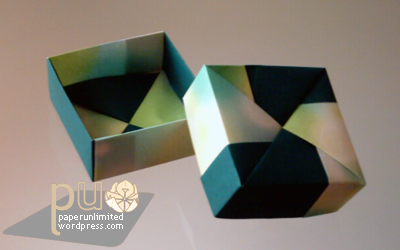 This entry was posted on 2007|02|24 at 12:27 and is filed under modular origami. You can follow any responses to this entry through the RSS 2.0 feed. You can leave a response, or trackback from your own site.